This morning 10 kids came along to church with me. Next time we go 9 of them will be invited. Esbin was not on his best behavior today. Oh well I guess a 90% batting average isn’t all that bad. I had a good talk with him though and I am quite certain that he will be on his best behavior when he goes again in a few week. After church Teri Caton a lady that goes to our church took us to see a little girl who is in need of a wheelchair.I was a bit hesitant about taking 10 kids along with me but most of them stayed out side and played Frisbee while Teri and I went in to see the little girl and her family. Some of the people from our church were going to play soccer at a field in Antigua at 3 PM so we went to Burger king for lunch and then headed over to the orphanage until close to 3. Almost all of the kids in the younger kids section are still locked in a room with other kids that have chicken pox. Some of the nurses told me that the doctor wants to keep them in quarantine for another 2 weeks. I can understand doing that with the kids that are sick but what his reasoning is for locking up the kids that have already had it is beyond me, Especially considering that there are volunteers and nurses walking in and out of the room all day long. I am not sure what happened with the soccer game but we waited at the field for nearly a half hour and no one showed up. Come to think of it the kid’s Sunday school teacher is the one that told them about the soccer game. Perhaps there never was a soccer game planned and this was just his way of getting back at me for bringing 10 kids to an already crowded Sunday school class. Just wait and see how many kids I bring with me next Sunday. The kids still played soccer though but the game was held in my yard. I should have known this would happen because a few brave blades of grass were just poking their heads out of my mostly dirt yard. Today I went in to Hermano Pedro again. 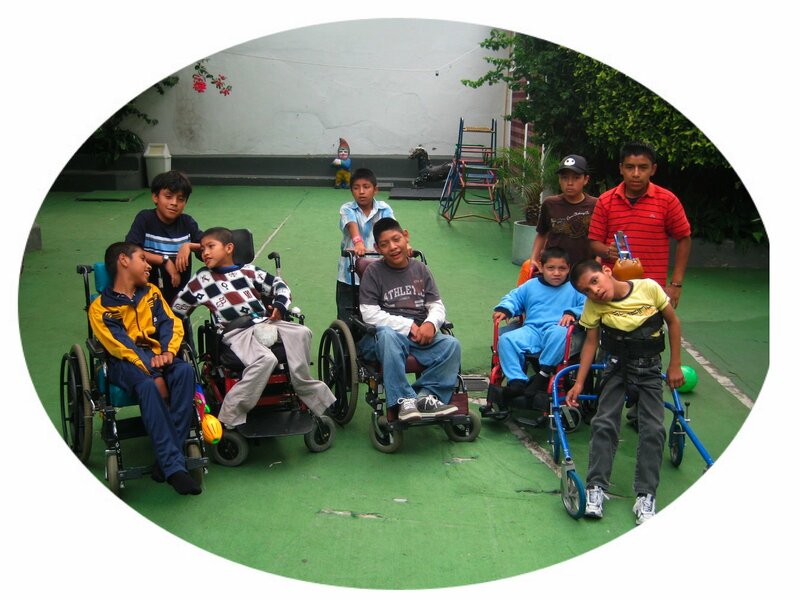 Several wheelchairs needed repair and a few of them needed to be made larger. Most of the kids were still in Quarantine but the doctor was checking them and trying to decide who if any of them he could release. Moyses, Byron, Minor, Elmer, and David are some of the more active kids who have been locked in the same room for over 2 weeks now and they gave me that look that said get us out of here, but my hand were tied on this decision. When noon rolled around no decision had been made so I signed out Gaspar who was one of the fortunate ones that had escaped the quarantine and took him to lunch. He had a great time and I think that he loved being the only kid to go. When I got back to the orphanage I discovered that Moyses, Byron, and David had been released. No one had thought to turn the power switch on for Byron’s wheelchair though, so for him it simply meant getting to sit in a different room. I quickly remedied that problem and soon he was towing Moises all over the place. David did his best to keep up with them but was no match for Byron’s power wheelchair. Poor Minor and Elmer, were not among those who got the green light and may have to stay in Quarantine for who knows how long. By the sound of their crying they made it clear to the doctor that they did not go along with his decision. Even though I had already been to lunch the 3 kids that got released kept begging me to take them somewhere. I went and found Carlos and we took them across the street for a breath of fresh air and a coke. I also told them that in a few weeks I am going to try to take them to the zoo. At 4:00 I made a change of location and of kids. I went home. It was what ever you can find in the cupboards and fridge night tonight. I let the kids stay for quite a while because I am planning to be on the road again starting tomorrow. Having this many kids in the house and in my yard for this many hours has its advantages. Not a crumb of food being left in the house helps assure that there will be no rats when I return. Also after tonight’s soccer game I don’t have to worry about having to cut my lawn when I return, or for the rest of the year by the way things look. Before heading for home several of the kids used my computer to call family in the USA. The calls are extremely inexpensive and it seems to mean the world to them and to there families. Well we plan on doing a lot of driving tomorrow so I better head off to bed. This morning Benjamin and I headed out to Huehuetenango. We plan doing camp recruitment for the next several days and then join Chris and some of the others in a town near here on Friday night. 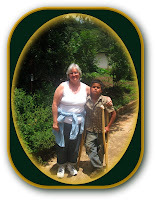 We are doing a wheelchair distribution there on Saturday. 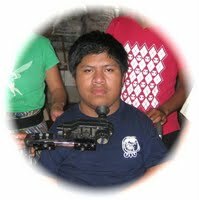 Our trip to Huehuetenango took us close enough to Christopher’s home that we were able to return his power wheelchair that we had taken with us to be repaired last Thursday. Monday Saul had spent most of the day in the wheelchair shop getting it ready so that I could return it to Christopher today. Benjamin and I got into Christopher’s town shortly after lunch time. We left Christopher’s wheelchair in my Land Cruiser and hiked up to his house. He was happy to see us but really got excited when I told him that we had his wheelchair with us. He asked his mother if he could go out and see it. Last week she carried him all the way out to where they keep his wheelchair, so this week I offered. All I can say is I think that his 100 pound mother must be in better shape than this 200 + pound man. I was exhausted by the time that I reached the road. Before bringing his wheelchair to the people who store it for him Christopher gave it a long test ride. It never ceases to amaze me what healing powers a bit of mobility seem to have. Just five minutes of driving his power chair brought a complete change to Christopher’s appearance. It is to bad that he can not keep his wheelchair right at his house but ever since the land slides of Hurricanes Stan there is no easy trail in to where he lives. Before we left Christopher’s mother showed us the x-rays that the doctor had taken of Christopher’s brain. There is deffentely a large mass of some type forming on the left side of his brain. They were unable to go in for further tests on Monday but are going to try to get in on Thursday. When we got to Huehue it was only about 3:30 but since we were in the middle of a thunder storm there was no way that we could do any visiting today. We are going to try to get an early start in the morning because we hope to visit a lot of people in the next few days. Tonight once again finds us at the San Francisco Hotel in Huehuetenango. We did a lot of traveling today and actually got to within a few miles of the Mexico border. We managed to get invitations out to 7 campers today. That may not sound like many but most of them are scattered all over the place. We encountered a variety of welcomes, or in one case an unwelcome. A visit to a small repair shop that is operated by one of the married people that has come to our camp on several occasions proved to be a bit unusual. He and 2 of his buddies were on the floor of the shop and were very drunk. At first they were not at all friendly but calmed down a bit once they realized who we were. We didn’t stay long though because they were really out of it and we felt that they could not be totally trusted in their condition. When we got back to the car we were met by the wife of the man that comes to camp. She told us that her and the children had gone over to a friend house because her husband had started hitting her. She assured us though that they were coming to camp and promised that he would not do any drinking while they were there there. I had to remind myself that he was one of the reasons that camp is so vital. Our next visit was entirely the opposite of the previous. 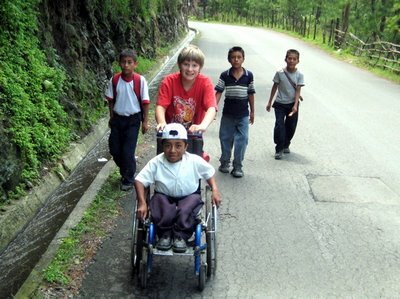 As we were driving up a seep hill out of the town where we had experienced the less than comfortable visit we saw a boy in a wheelchair being pushed up the steep hill by another boy. I immediately recognized them as Jose and his brother Mark. 2 years ago while recruiting for camp Chris and I had stumbled across Jose in much the same manner. 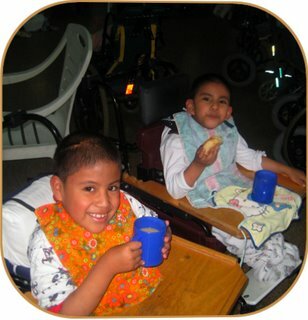 Even though Jose is in a wheelchair he manages to make the one hour trip to school and the hour and a half return trip home everyday. Today when I pulled along side of Jose with my car and rolled down the window he immediately recognized Benjamin and myself. I wanted nothing worse than to offer him a ride. The trail in to his house was still another half mile up the steep winding road. I knew though that I didn’t dare load him into my car and I think that he and his brother knew it as well. The area where he lives is still highly suspicious of Americans and many of the people living there are still convinced that foreigners want to kidnap the children for body parts. We told Jose though that we would drive the car up to a spot that is near to the trail that goes to his house and then we would walk back and help him the rest of the way home. I don’t know who was more relieved Jose who’s arms had to be aching or his brother who was helping push him up the mountain. After parking my car walking back down to where Jose was and then pushing him all the way to his house we realized how badly this young man wants an education. Over the past few days I have also gained a greater appreciation for moms and brothers who are wiling to give their all to make the life of a loved one just a little brighter. Our visit with Jose and his family soon made us forget about the not so pleasant visit that we had just encountered only a mile or 2 away. Our last visit of the day involved a 4 wheel drive ride up an even steeper mountain side. Climbing 3000 feet in less than 15 minutes provided an interesting ride and a spectacular view. As we reached the trail that led in to where Pasqual lives our view suddenly disappeared though. A few scattered clouds suddenly turned in to a black sky and we found our selves in the middle of a thunder storm. We decided though that since we had driven so far and to return here tomorrow would cost us hours of time we decided to break out the umbrellas and hike in to Pasqual’s house. The umbrellas did some good but we still got wet. 15 minutes later we arrived at Pasqual’s door. He and his family were a bit surprised to see us but were happy that we had come. Much like Jose’s family Pasqual, his wife, and children made us feel like long lost friends. They felt bad that we could not stay longer but understood why we could not. We knew that we had to get back to our car and down the mountain as soon as possible or we would likely be overnight guests. The ride down the mountain was a slow one but we didn’t encounter any problems even though the road had become extremely muddy. About an hour and a half later we finally arrived back at our motel. Tomorrow we plan on heading out to Aguatenango to see more campers. We are going to try to get an early start because it seems like the rain is coming in like clock work every afternoon at around 3 PM. We had another fantastic day today. Our first stop was an unscheduled one. I had a list of around 20 campers that we were not intending to personally visit this year. Instead we were going to give the list to Don Feliciano, a good friend who lives in Aguatenango. He was going to see to it that these people got contacted. Even though he has done this before and has done a marvelous job of it both Benjamin and I felt compelled to go and see one of the families that was on his list. It wasn’t a convince thing because Marvin and his family live way of the beaten path and the 45 minuet hike in to their house is no picnic because the air is thin at 8000 feet. Still we both felt that it was something that we needed to do. Around 2 hours after leaving Huehuetenango we reached the spot where even a Land cruiser could not go. We asked permission to park it at the school that was at the head of the trail that leads to Marvin’s home. A teacher of the school was more then willing to watch our car for us. So were all of the kids who stared at us as though we were the firs white people that they had ever seen. I think that for most of them we were. I don’t think that it was recess time but soon all of the kids and teachers were out side visiting with us. We were a bigger attraction than a 3 ring circuses. I asked if Marvin was perhaps in school. I knew that when I last visited his family 2 years ago his father was carrying him on his back in to school every day. Most of the time he carried his wheelchair as well. This was no ordinary 45 minute walk but a 500 foot assent up a steep trail that led from their home. One of the teachers told us that Marvin had been having some health problems and had not attended school this year. He offered to send Marvin’s older sister, who was at school, down to Marvin’s house with us but I told him that we could find the way. He asked me if I was sure and I said yes. Two years ago I had marked the way on my GPS. I thought about showing it to him but figured that there was no way that he would believe that a little gadget that fits into my shirt pocket could do something that requires a guide. The walk down the steep muddy trail went well but we kept looking back thinking about the steep hike that we would have on our way out. It had been foggy when we started down the trail but within a few minutes we broke out of the clouds and were provided with a spectacular view of the valley below. There were a few dogs along the way that seemed to not want us using the trail but Benjamin is a good aim with a rock and they soon politely let us go on our way. Marvin and his parents were surprised to see us and we visited for a long time. They told us that Marvin had just gotten back out of the national hospital in Huehuetenango where he had been suffering from a bladder infection. It sounded like the doctors wanted Marvin to have surgery but the family had run out of money so Marvin was sent home. His father was considering selling some of his land so that they could take Marvin in to Guatemala City to get a second opinion and the surgery if needed. I told them about Hermano Pedro and the American specialists that often come there. When I told them that the price is extremely low because the doctors donate their time they could hardly believe it. Even though the cell phone signal was good I could not make contact with Jessica at the hospital but promised that I would get in contact with them as soon as I did. Marvin and his family said that they were praying that things would work out that we could get him in to the hospital there. It has to be so hard to see your child suffer when you know that money is the only thing keeping him from getting the help that he needs. Next we talked about school. Marvin’s father said that as badly as they want Schooling for Marvin and as badly as he wants it him self, it is no longer possible to carry Marvin to school. With the infection that he has Marvin can no longer tolerate being carried that far every day and now that he 13 he is getting heavier and it is just to difficult for his dad to carry him up and back each day. I asked the family if they knew of the teaching program that we had for kids like Marvin who were unable to attend school. They had not heard of it but were on the edge of their chairs when I explained it to them. I asked if it would be hard to fine a teacher that would be willing to come to their home a few times a week and teach Marvin. Both mother and father said that they knew that it would be no problem at all. Some of the teachers that taught at the school where I had left my car lived quite close to Marvin and the family knew for a fact that since they only taught until 12:30 each day they would love some extra work. I told them to find the teacher that they thought would be best and we would help them get things set up when they come to camp in November. They looked at Benjamin and said something that I did not fully understand. Benjamin translated what they said into English. They had told him that this had to be one of the best days that they have ever had. The possibility of getting medical help for their son, some cash so that they can get to the hospital, the promise of schooling for him, ( I did promise the schooling. Now I need a sponsor.) an invitation to camp, and a visit from good friends. What seemed to be little more than a cup of water to us, meant everything to them. They told us that they knew that our visit was no ACCIDENT but that it was the leading of God. We knew it to. By the time we got back to the car the school was just letting out for the day. At first the kids were a bit shy but when we threw a hand full of suckers and some small super balls into the air we nearly got stampeded. It was really funny though because when we threw them all of the kids just stood back and watched them hit the ground. For a few seconds no one moved then everyone seemed to get brave all at the same time. When I reached into the car for more candy I almost got mobbed. I tried to make sure that everyone got some but there was no way to make sure. We saved only enough so that we could hand or throw some to kids that we saw as we drove down the mountain. We seemed to get the same reaction from most of the kids. Most of them were to shy to come close enough to the car to take the candy from us and even when we tossed it to them they would leave it lay until we had driven on a small ways and then make a mad dash for it. Our next and final visit for the day was at Don Feliciano’s store. Feliciano and his wife have attended all 6 of our camps and are planning to return this year. He credits camp for changing his whole outlook on life. I remember the last evening of the first camp that we ever had. Feliciano got in front of all of us who were at camp and shared that he had felt that since he was in a wheelchair that he no longer wanted to live. He also shared that meeting so many other people who were in wheelchairs was giving him a vision of reaching out and helping his fellow Guatemalans who had handicaps. With in a few months he invited us into his town to speak to some handicapped people and their families. To our surprise what we thought would be a few people ended up being a few hundred. Shortly after that we did a large wheelchair distribution in his town. Now a few years and distributions later Feliciano has 2 schools going. One for deaf students and another for students who are physically or mentally challenged. Feliciano, his wife, Benjamin, and I walked down to a little restaurant a few blocks away. Actually Feliciano’s wife, Benjamin, and I did the walking. 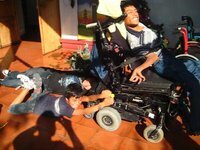 We took turnes pushing Feliciano who is confined to a wheelchair. It seems that everyone that wee met stopped to say hello to him. You can tell that he is very respected by everyone in Aguacatan. At lunch he shared with us that it was not that many years ago that he did not dare to come out of his house for fear of what people would think of him just because he was in a wheelchair. He also shared that even though he has been instrumental in getting the handicapped people in the area out of their homes and into society, there are still a lot more that still fear to come out of their homes. We only made 2 visits today but they were 2 visits that were well worth it. At the first home we were able to give just a little glimmer of hope to a family. At the second we were able to witness how far some one is able to go once they are given that glimmer of hope. Cool thing was both families, even though they appreciated the efforts to help, were not giving the praise any people or organizations but to God. I am thankful to God that he chose to use us to help deliver those few glimmers of hope. This morning we drove to Saloma. The view on our drive to Saloma was spectacular. At one point we were over 11,000 feet above sea level. Our first stop was at the home of Jamie. Two years ago while looking for someone else we ACCIDENTALLY stumbled across Jamie. At that time we invited him to camp and he has been coming to camp ever since. Today we didn’t have to walk all the way to his house because about 50 feet from where we had left the car we met Jamie and one of his daughters coming down the trail. Jamie was happy to see us and after giving us a hug handed us a packet of paper work. He had found some more people that were in need of wheelchairs and had been carrying their applications with him where ever he went just in case we showed up. 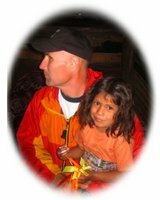 Jamie and his daughter were more than happy to help us locate the other 4 campers that we wanted to visit in that area and before we know it we had all of the Saloma invitations handed out. After a quick lunch we headed to Todos Santos. After again reaching over 11,000 feet we turned onto a road that I had never before traveled. We had been told that the turnoff that was about half way between Saloma and Huehuetenango would be easy to spot because it was the only turn off that was paved. What we were not told was that the pavement ended in less than a half mile and that we would be descending from over 11,000 to around 9000 feet on a narrow dirt road. Other than a few small land slides that made the going a bit difficult in places the road was in fairly good shape. We hope that no heavy rains come in during the night though or we may have to stay here in Todos Santos for more then one night. Todos Santos is a quaint town that has not changed to much in the past several hundred years. Nearly all of the people still wear their traditional costumes. I had to laugh a bit because the pants that the men and boys wear look exactly like the red and white striped ski pants that I wore back in the 60’s. The only diffrance is that the pants that they wear here are not bell bottoms. Our rooms tonight are modest, My room has a bed with a small table at the foot of it. If you don’t have wide feet you can actually walk between the bed and the wall. I don’t think that many of the people that stay here have cars though because we had to park about a quarter mile away at the home of the motel owners mother in law. We were told that the showers have hot water but I am not sure that I am going to take one because much like the toilets they are located in a separate building that is about 50 feet away. The walk back to my room in the rane may kill the effect of a warm shower. I have to be a bit careful because I have had a head cold for the past 3 days. All of the changes in elevation has done little good for my sinuses. Chris, Donna, and the rest of the crew have not arrived yet but we are expecting them shortly. I had a fairly rough night because my throat and head were really bothering me. Last night Donna had prayed that I would feel better by morning but I was beginning to wonder if I was going to be able to make it to today’s wheelchair distribution. When 6 AM rolled around I was feeling a lot better so I headed out with the rest of the group to help prepare for the wheelchair distribution. We had to get an early start because it was market day in Todas Santos and we had been told that getting cars or trucks down the narrow streets would be next to impossible once all of the people arrived from surrounding villages. We left our cars where we had parked them last night and walked to the school where the distribution was to be held. Even though it was only 6 AM the town was full of activity. A lot of people were setting up little stands or simply finding a spot to set their baskets of fruit, vegetables, chickens, or what ever it was that they were hoping to sell. I think that this has to be one of the most traditional places in Guatemala that I have ever been. Other than seeing an occasional person talking on their cell phone it seems that little has changed over the years. The traditional dress is colorful and can be described best by some of the photos that I am including. Even though the people here see very few strangers they are very polite and friendly, and unlike many other remote places that we go into there does not seem to be a fear of Gringos. 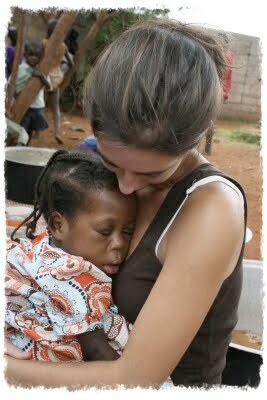 Even the children that we put in wheelchairs today, although shy at first, did not seem frightened of us. Sometimes it takes a fair amount of time to get them to relax enough to be able to properly seat them in their wheelchairs, but most of today’s kids were very much at ease right from the start. George walked to the edge of town where he had found a place to park his truck during the night while the rest of us set out to locate the school. On our way there we spotted a man who had a little boy with him that was in an old adult wheelchair. He didn’t appear to be one of the local people and seemed to be looking for some one or some thing. We figured that he had come from an outside village and had been invited to the wheelchair distribution so we walked over talk to him. Fortunately he understood Spanish. We were surprised when he told us that he had simply come in for market day and knew nothing about any wheelchair distribution. He also shared with us that his son was only able to accompany him because someone had loaned him an old wheelchair. The boy had CP and the wheelchair that he was in was in rough shape and provided nothing more than transportation for him. 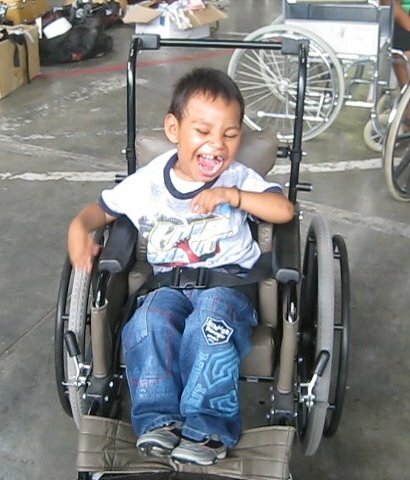 He needed a wheelchair that fit him and gave him more support or his condition would rapidly deteriorate. One problem though, he was not on our list and we had no application for him. We had only brought a limited amount of wheelchairs and were not sure that we should take the CHANCE of inviting him and not having enough chairs for those that were already on our list. CHANCE? Had it been by CHANCE that this father had borrowed a wheelchair and brought his son to a town that was 2 hours away from where they lived on the exact day that we were giving out wheelchairs? I guess if this had all happened by CHANCE we would be willing to take a CHANCE that we would be able to provide them with a wheelchair. Once we got George’s truck unloaded we headed out to find some place to eat. After walking a few blocks we located a small place that served breakfast. The restaurants here are not exactly your traditional Denny’s but the food was good. After breakfast we walked back to the school where families were already starting to gather to receive wheelchairs. 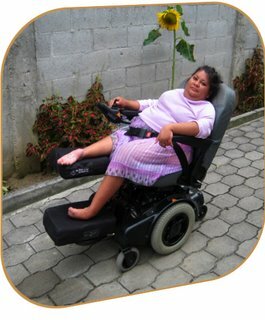 I was thrilled to see a girl that had received a wheelchair from us at a distribution in Huehuetenango a few months ago. She had no use of her right arm so even though we were able to put her in a chair that was comfortable for her she had no way to move herself around in it. I ran a few tests and determined that she would be able to operate a power wheelchair. At that time we asked her family to bring her back to today’s distribution but could not be certain that they would. Thankfully they brought her back today and thankfully we were able to fit her into a power wheelchair. She had driving it down to a science with in a few minutes. Many of the brothers and sisters of those that came in for wheelchairs were more than eager to help when ever we asked any of them to tighten a bold or help in any way, and my battery power drill was a big hit with some of the older kids. 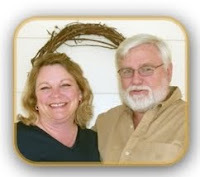 We had several difficult cases but we also had a lot of experienced people doing the seating and everything went well. By 2 PM we had every man woman and child that had come in for a wheelchair professionally fitted in a wheelchair that was perfect for them. The total day was awesome but I think that my highlight was the final fitting we did. Marcos and I got to seat the little boy that we had met out on the street this morning. Since he was not on our list he had to wait until we had given everyone else a wheelchair just in case we ran out of kids wheelchairs. We didn’t run out though and he received a brand new chair that was perfect for him. During the hour that it took to fit him his father stood there looking at us in disbelief. Earlier today he and his son had come to town. Perhaps to shop, perhaps to beg. Now just a few short hours later his son had been given something that his father could only have dreamt about being able to purchase for his son. Can you imagine the story that he would be able to share with his wife and other children when he and his son returned home this evening. I pray that he also shares with them what Chris had the opportunity to share with everyone that was at the distribution. That was the story of Christ’s love for each and every one of them. It is some times hard for these people to comprehend how some one can come in and give them something as precious as a wheelchair with no strings attached. I can see why it can at first be difficult for them to imagine that some one would lay down His life for them with no strings attached. 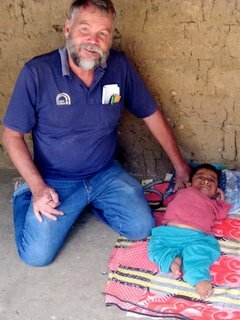 We can only pray though that just like this man and his son who stood in unbelief until they saw the wheelchair, that the realization of the love of Christ will become just as visible to them. We all stayed in Huehuetenango last night then Chris, Donna, and 5 others headed back for home. Benjamin and I are planning on staying out for a few more days. We were only a few hours from Nebaj so we decided to do some camp recruiting done there and then head on down to Quichie to see several more families on Monday. On our way to Nebaj we discussed weather or not to take a short cut. It cut off a few miles but included 15 miles of some of the steepest bumpiest dirt road that I have traveled here in Guatemala. I have driven it once before and knew that it also included some of the most breathtaking scenery in Guatemala. In 15 miles you clime several thousand feet and drove through small villages that have not changed much in hundreds of years. When we got to the turn off to the short cut made the decision to take it. About 5 miles up the dirt road, which was even bumpier than I had remembered we saw a man who was walking the same direction that we were going. As we drove by him he motioned to me indicating that he would like a ride. We had plenty of room so we obliged. He told us that he lived about 10 miles up the hill and was hoping that some one would be willing to give him a lift. I imagine that had we not picked him up it would have been quite a while before another car came by. As we drove we visited. 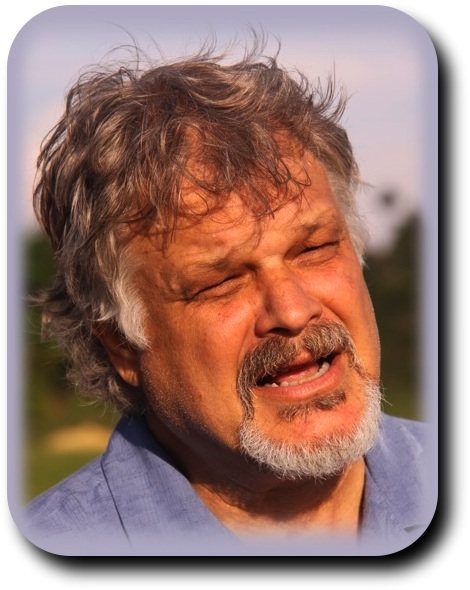 We told him a little bit about ourselves and the wheelchair ministry. He told us that he had a niece who was 16 years old who was in need of a wheelchair. When we found out that she lived only a mile or 2 from where we were taking him I offered to stop and see her. He also told us that he was a Christian and asked if we knew of any Spanish Bible studies that he could do at home. I promised that I would look into it when I got back to Chemaltenango. About a half hour later we passed his home and shortly after that reached the home of his niece. When we first arrived at the house we found her home alone lying in the dirt in front of her house. Her uncle called out into the fields where some people were working and soon her sister came to the house. She told us that it would be wonderful if her sister could get a wheelchair because the family is unable to take her anywhere. Soon we had all of the information that was necessary and promised that we would contact the family when we did a distribution in Nebaj and a month or 2. We also left the uncle with some extra wheelchair forms because he said that he knew of other people in that area that had similar needs. We drove away thankful that we had HAPPENED to take the short cut and had ACCIDENTALLY met this caring Christian man. When we arrived in Nebaj we went directly to where Donald lives. Donald can best be described as an old American hippie who ended up in Guatemala and for some reason never returned home. Although Donald is not a Christian and wants nothing to do with Christianity himself he has fallen in love with the people of Guatemala and under a very rough grizzly bear exterior is a gentle person who has done a lot to help some of the less fortunate where he lives. Not only has he helped us find people who need wheelchairs and invited them to distributions that we have had in Nebaj but he also pays a teacher to teach several handicapped children that live in Nebaj. Up until last time we visited his family consisted of a cat and a dog. Today he told us that he has taken in 2 more strays, a dog and a boy. He said that neither of them had a place to live so he took them both in. He said that at first the boy was harder to train than the dog but things are getting easier now. After feeding us lunch he sent the boy (Freddie) along with us to help us locate 2 people that we wanted to invite for lunch. Freddie and Benjamin hit it off greatly and I think that he would have gladly spent the entire day with us except for the fact that we were on our way to Quiche so after visiting the 2 homes we said goodbye and were on our way. Tomorrow we hope to get an early start so that we can possibly finish up here and head for home on Tuesday. Well it is once again Bedtime so I will say goodnight. We just got back into Chemaltenango after being on the road for 7 days. We hadn’t planned on getting back home until tomorrow some time but things went faster than expected today. We got an early start and finished up on the list of people that we wanted to visit in the Quiche area by 1:30 Pm. Sometimes a visits of an hour or 2 are not uncommon but since Benjamin and I both have head colds we cut or visits a bit shorter than usual. About the only place that we stayed at for more than a half hour was at Timothy’s (Tiny Tim’s) home. I had forgotten how small he was until I saw his father carry him out of their house. His power chair that has a seating system that was originally made for a 2 year old still fits Timothy perfectly. It is hard to believe that he will be celebrating his 17th birthday in January. Timothy’s mother and brothers and sisters are still quite shy but his father is quite a talker. Timothy is also getting more talkative. We made one more stop after visiting Timothy and then headed for home. Once again we were faced with the decision of what road to take home. Or perhaps I should say weather or not to take a road home. Two years ago when Chris and I got stranded in this area we took some dirt roads home. Actually I wouldn’t even call them roads but since most of them had been carved into the side of the mountains for at least a hundred years they were less susceptible to land slides and we were able to make it home on them. That trip was not a fast one because we had to stop and ask directions every time there was a fork in the road. I had my GPS with me though and even though non of these roads were on it at that time I recorded our trip and now have it on my GPS. We knew that taking the paved road would require us to back track for more than an hour and then we would still be nearly 3 hours from home so we decided to trust the GPS and try to retrace the path that Chris and I had taken 2 years ago. The drive was extremely bumpy and there were sections of road where I wished that my car were a little narrower but in just a little over 2 hours we were driving into Chemaltenango. Following the GPS was a breeze. And not having to stop and ask for directions every few miles had to have saved us several hours. If you are wondering how I can find the time to write after being gone from home for a week it is because I am not actually home yet. I stopped of at the wheelchair shop and am finishing up on my journal here before heading home. I am anxious to see the kids but feel that if I get this done before going home I can give them my full attention in a few hours when I finish up here. I know there are going to be plenty of stories to here and a lot of Band-Aids to catch up on. This past month of camp recruiting has been great and I wouldn’t have missed it for the world but I am glad that it is almost over. Chris and Donna are going to try to make it our for a few days then I should be able to finish up by going out for three or four days. I am going to give it about a week before going out though. It is time to focus my attention on the kids for a while. Both those and home and the ones at the orphanage have been very understanding about me having to be gone so much lately but that doesn’t mean that they didn’t miss coming over or having me do stuff with them. I know they missed me but not half as much as I missed them. I woke up feeling fine this morning. I guess that I just had a touch of the one day crud. Only 4 kids joined me for church today. A few of them are still a bit gun shy from the encounter that they had with their Sunday school teacher last week. Pastor Mike told me that last weeks teacher was only felling in for the regular teacher and they are presently looking for one more teacher for some of the older kids. He told me that he did not want me to discourage any of my neighborhood kids from coming to Sunday school in the mean time though. The service that we had was great. Mike may not look or act like your average preacher but he is certainly a man of God. I think that is one thing that drew me here. Not many of the missionaries that I know down here fall into the category of what I always pictured a missionary to be like; No shining hello, no wings, just ordinary people who are willing to be where God wants them to be and willing to do what ever it is that God wants them to do. Today we didn't visit the orphanage or go out to eat. No, it wasn’t because of anything that any of the kids did in Sunday school. They gave their teacher no problems today. I had to take them straight home because Fernando was having a birthday party. Yep, this is the same Fernando who just had a birthday 3 weeks ago. No he wasn’t trying to pull the wool over anyone’s eyes like Calin use to do. Besides that, Calin always waited at least a few months before having another birthday, he knew that even with my memory I would have caught on if he had them only 3 weeks apart. Today Fernando was simply celebrating the birthday that he had 3 weeks ago. His mother had sent his relatives some money from the states so that they could have a party for him. We all had a good time and near the end of the party I ran home and got my computer then quickly downloaded and showed the pictures that I took at the party. Wow! It doesn’t seem that long ago that we had to wait several days to get our pictures developed and then hope that the developed pictures that we got back were actually our own. Anyway everyone had a lot of fun looking at the pictures and videos of the party. Ashley and Judah came over to my house at 6 PM. They are returning to the States tomorrow so we decided that it would be nice to go out for supper together tonight. No I didn’t get out of cooking. The kids were waiting for me when I got home. The cheep microwave that I bought just a few weeks ago is proving to be exactly that, Cheep. Last week the #1 button quit working. Tonight the #2 button quit. At this rate in another month we will only be able to cook things that take 6 minutes or longer. Warranty?? Let me remind you this is Guatemala. Just last week I bought a pair of reading glasses. When I got to my car and opened the case I realized that the glasses were a different strength then what it said on the case. When I walked back into the store to return them I was told that the warranty had expired. Well it is time for bed. I think that I will go crawl into bed. I hope that the mattress doesn’t suddenly self destruct. After all it is nearly a month old now. Chickenpox has come to Hermano Pedro. At present it is only in the ward where the younger kids are but it is spreading rapidly among them. They have separated all of the younger kids into 2 rooms. The kids that have never had chicken pox are in one room and those that presently have or have had chickenpox in the past are in another room. I think that the ones that are suffering the most are the kids that had it in the past. Since they are staying in the same room as those that presently have chickenpox are in, they to are under quarantine. I had planned on taking Moises, Byron , and David out to lunch today but all 3 of them fall under the category of the have had chickenpox kids so even though they are perfectly well they will have to stay in the room with the sick kids until it has been free of anyone with chickenpox for 2 weeks. I can see the orphanage’s concern for having it spread to the other kids but nurses and volunteers are allowed to go from one room to the other, often times having just held or fed one of the sick kids, without as much as washing their hands. The 3 kids that had planned on going felt bad but cheered up a bit when I told them that I would do something special with them when they were no longer under quarantine. A couple from the USA had planned on joining us for lunch but as soon as they heard the word chickenpox they made a hasty retreat from the orphanage. I can’t blame them though. They have been here for several weeks trying to finish up on the adoption process of a little boy. If he were to get sick it could delay the process even longer. I managed to take Esbin out to eat though. He is a sad boy who seldom smiles. He has been at the orphanage for around 6 months now. The court system took him away from his mother after she repeatedly beat and nearly killed him. I have heard that before the beatings he was perfectly normal. Unfortunately due to the physical and emotional damage that was inflicted on him it is doubtful that he will ever be normal again. I have occasionally seen a glimmer of hope when he seems to come out of his own private little world for just a minute or 2 when receiving some much needed attention. Only on these rare occasions will he actually make eye contact with you and then break out into a big smile. Today at lunch I witnessed one of those moments. It made the walk to Camperos well worth it. While I was at the orphanage Jessica called me on my cell phone and asked if I would be willing to see a little girl who’s parents had brought her in to see one of the doctors. She could not walk and already had a wheelchair but Jessica was wondering if she could perhaps use a walker. She was a delightful little girl who was 8 years old. Her leg strength was marginal but her desire to walk was all there and then some. The hospital had been given some used walkers and although they were in good shape I knew that they would be to heavy for her. Fortunately just 2 weeks ago I had transferred Ervin over into one of these heavy duty walkers. Ervin has been with me on to many trips to Camperos and is getting to fat for his old walker. I told the parents of the little girl that we could loan Ervin’s walker to them for 2 months and then if it proved to work out for them we would make arrangements to give it or one like it to her. I have to be stingy with this type of walker because we have access to so few of them. After about 15 minutes of adjusting the walker to her needs I put the little girl into it. It was perfect for her. It gave her just enough support that she could hold her balance and walk on her own but still gave her complete freedom to use her hands without having to hole on to anything. Both the little girl and her parents were beside themselves with joy. I received hugs from all 3. Since she lives right in Antigua we are going to monitor her progress on a regular bases and hopefully she will gradually gain enough strength that with in a year or so she will be walking on her own. Since I am planning on being on the road again starting tomorrow morning I had a lot to do tonight. I decided though that there was no way that I was going to lock the kids out. Some of them helped me by sweeping and taking in the laundry. Some tried to help. and some simply played. In spite of constant interruptions I managed to get enough accomplished that a 8 PM we all jumped into the car and headed off for some Pizza. When we returned home at around 9 we all said goodbye and I headed into the house alone so that I could get some of the work that requires a bit more concentration done. I may have to burn a little midnight oil tonight but the time spent with the kids was well worth it. I will miss them while I am gone for the next several days. This morning Saul, his wife Hanna, (Chris and Donna’s daughter) and myself headed out for the Esquentla Area. Saul and Hanna will be joining me for the next several days as we do more recruiting for camp. Not only did we see campers and their families today but many of the people that we visited had other people that they wanted us to see. It seems that the needs are sometime overwhelming but we seldom turn down a request to at least go and talk with the people. Some need wheelchairs or medical attention. others are hungry. many ask for prayer. All of them need to know that someone cares and often times even though we can do little more than offer a glimmer of hope by giving them misquito netting, a water filter, or even a hug, they at least feel a little less alone by just knowing that they are not forgotten. Saul and Hanna have done a lot of wheelchair distributions and been involved with the ministry in so many other ways over the years but visiting the homes is a fairly new experience for both of them and they seem to really enjoy it. Along with their role in many other parts of the ministry, they are also planning on becoming involved with the tutoring programs that we are have going on. As we continue to add new kids to the list of those that we are helping to get an education we are also recognizing a need for more help in visiting the students and in finding teachers. I think that with their language skills, knowledge of the culture, and evident Christ like love for the people, that they will be a very welcome addition to this program. We had a great day of visiting with old friends and meaning several new ones and are looking forward to doing the same tomorrow. Tonight I am back at my home away from home, The Bamboo Motel. This is quite a treat compared to the hotel that we stayed in last night. Actually my room was not all that bad but Saul and Hanna’s room left a little to be desired. We asked the lady at the desk for 2 rooms that were not facing the street. They got that one 50% right. After a few busses and a semi truck went by they quickly got a different room. Believe it or not even though this was a nothing to brag about hotel Saul and Hanna told me that it had a hot tub in it. I though that they were kidding and it was perhaps a sink hole in the floor but sure enough it was a genuine hot tub. Unfortunately there was no way to make the water in it hot and the pump didn’t work but there it was. One luxury that we do try to get when we are staying near the coast is air-conditioning. They are usually much to small to do an adequate job but if you get a room with a good one in it you can often get the temperature down into the low eighties. Last night I experienced one of those rare occasions, Saul and Hanna did not. Even on the back side of this hotel the sound of the trucks and busses that go by bother any one with normal hearing. Fortunately I do not have normal hearing. Some people claim that I have no hearing but I never listen to them. Unfortunately Saul and Hanna hear well. Sergio’s house was our first stop of the day. He and his mother been coming to camp for as long as I can remember. Sergio who is 13 and has only had a few years of schooling has expressed a desire to return to school. However the rough roads that lead from his house prevent Sergio who is fairly heavy from being able to leave his house without the help of at least 2 adults. His mother has been trying to find a tooter for him but so far has had no success. This morning while visiting with him we asked him what his biggest wish was. He told us that it was to actually attend a real school, but the difficulty of getting from his house to school was impossible. On the rare occasions that he does leave the house it takes the effort of 2 strong adults to get him anywhere. His mother told us that the town keeps promising to pave some of the streets but it never happens. We asked his mother if there were any schools that were closer to his home than the public school that was a long ways away. She told us that there was a Christian school but it was private so there would be cost involved and there were still hills and rough terrain that led there. I knew that it would have to be a really powerful and tough Wheelchair but I wondered if there was a possibility that a power wheelchair could navigate the rocks and hills that lead to the school. With in minutes Sergio’s mother, Hanna, Saul, and myself were walking towards the school. We decided that the first trail that we went on would be impossible for anything but a mountain bike to navigate. Were there other routs that were a little smoother and not quite as steep? We walked various alleys and paths but each one of them had obstacles that would prevent even the best of power wheelchairs from navigating them. After doing a lot of zigzagging around we figured out a rout that was rough but possibly navigate-able. The biggest hurtle would be the first hill that led from Sergio’s house and then a section of extremely rough dirt road. I told the others that Stephen use to have a Ranger power chair that we took down trails that were worse then these. It was built tough and climbed like a tank. Perhaps if we could set up one of them for Sergio it would do the job. I still questioned the first steep hill though. 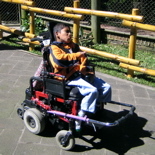 Saul comented that if only we could get our hands on a Ranger power chair and give it a try we would know. Then we could peruse getting Sergio into school. We didn’t want to get his hopes up and then have them shattered. 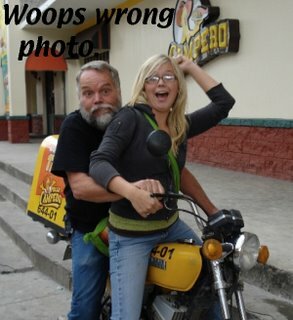 Waite a Minute! Just last week I had taken Mario’s power wheelchair home from Mazatenango. It had some electrical problems. Mario had told me that he had a struggled getting up the hill that led from his house with it so when I got it back to our shop I found a stronger chassis that had larger motors on it and one of the guys at the shop mounted Mario’s seating system on to it. I wasn’t even sure what kind of chassis it was but knew that it was built tough and had very large motors on it. It just so HAPPENED that Mario’s wheel chair was buried under our luggage in my car. Knowing how lost Mario would be with out his wheelchair we routed this trip so that we would be able to get his chair back to him. We were soon unloading all of our luggage and getting the power chair out of my car. Even though we could not give this chair to Sergio we could at least see if a power chair navigated these rocks and hills. As we were getting it out of the car I said that I still tough a Ranger would be the best chair for these Conditions though. Once we unloaded it I looked it over a bit more closely. I had been in quite a hurry when I picked out the chassis on Monday because I know that we would be leaving on Tuesday and the mechanics would only have the day to do all of the necessary modifications to it. I had not even paid attention to it all I know was that it looked strong and had larger motors on it. To my surprise it HAPPENED to be a Ranger. It was exactly the same kind of chair that Stephen use to own. With all of the different makes of wheelchairs out there I wondered what the CHANCES were of that HAPPENING, and weren’t we LUCKY that we HAPPENED to have a power chair with us? Or was this another Godincidence? Saul weighs just a little more than Sergio so we figured that if the chair would climb the hill with him in it then it would have no problem getting Sergio up the hill. It worked!! Soon we had Sergio in it. Since he had never driven a power chair before we kept him on flat ground but he did well with it. I made a quick call to Chris to see if perhaps we can get a chair like this one on the next container. Chris told me that it was good that I HAPPENED to call when I did because there was a container scheduled to go out with in the next few weeks and he was just getting ready to call mark and give him a list of a some of the things that we needed. I am not sure that Hope Haven has any Ranger power chair but with the way that things have been working out I think that the CHANCES are pretty good. Before leaving Sergio’s mother asked if she could take us to one home. There we found 6 children, Their mother has deserted them and their father is trying to raise them on his own. His biggest problem is that he drives truck for a living and has to be gone a lot of the time. This very loving and caring father told us that he wants to do everything possible to keep his family together but his 15 Year old daughter who is mentally handicapped needs some one to work with her and teach her how to care for her self. Even though she seems capable of learning such things as dressing herself and being toilet trained, like most of the kids at the orphanage she has never been taught these simple skills. Right new it is a 12 year old brothers responsibility help her do all of these things. The father told us that he felt that if someone took her in for even a few months they could teach her these simple skills. He said that he didn’t want her to go to any place permanently but told us that if she could not at lest learn how to dress herself and how to use the bathroom he may have to consider those option. He know that it wasn’t fair to require is 12 year old son to do all of these things. 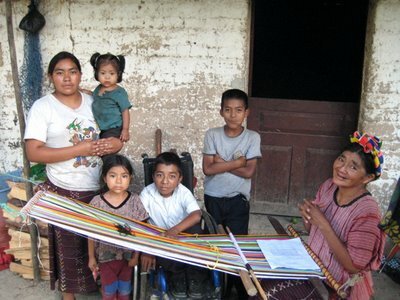 We promised that we would contact all of our recourses but also had to remind him that there are usually large waiting lists at the few places here in Guatemala that could provide any help. We suggested that he also check around his area to see if there was anyone who could come in and work with her. He told us that he has been trying but so far has found no one. The rest of our day was spent visiting more homes and running into more needs. We know that we can not make things better for everyone that we meet but are grateful that God allows us to help some of them. Yes, we sometimes get tired and a bit overwhelmed but after all that Jesus has done for us, how can we possibly not try to share a bit of that love with those He leads us to? After breakfast we headed to Mario’s home to give him his power wheelchair. After unloading it from the car I drove it down the paved path that leads to his house. This chair has a lot more power than his other one and I am confident that he will now be able to get up the hill that leads from his house. He and his family are so friendly that I am sure they would have been happy if we stayed and visited all day but we had a lot more people that we wanted to visit today. About an hour later we found our selves near Xela. The 7000 foot diffrance in elevation made for a welcome change in temperature. The past few days near the coast had been down right warm. Just a few miles from Xela we stopped at the home of Angelica. Angelica was another one of those Godincidence people that we have met. Chris found her when his car overheated last year and he pulled into a welding shop because he saw a water hose hanging by the door. A welding shop may not sound like a likely place for a 24 year old paraplegic to be but sure enough in the back of the welding shop was her families home. Last year was Angelica’s first year at camp but she is hooked. She told us that she would not miss this years camp for the world. Next we headed off to were Christopher, his mother, and several brothers and sisters live. You have to walk in to where Christopher lives. This was the first time that Saul and Hanna had ever been there. I have been in on several occasions and the people who live along the way are slowly becoming less shy and more friendly. Unfortunately some of the dogs are also getting less shy but no friendlier. Generally a hand full of well aimed rocks discourages them. Christopher and his mother were not at home but some of his brothers and sisters took us to an aunts house where Christopher was. Christopher was sitting in his manual wheelchair. His power chair has to stay at a friends shed near where we left our car. Even though Christopher is 12 years old his mother still has to hike him from where they keep hid wheelchair to their home on her back. Christopher was sitting up I could see that he was not well. He seemed unusually quiet and the left side of his head appeared be swollen. He showed some excitement though when we handed him his invitation to camp and promised that he would be there. I had wanted to talk with his mother about his health but we were told that she had gone to town. Last time we had visited she told us that he was having bad headaches and a local doctor had recommended that he see a specialist. Noticing that his head appeared to be growing larger and that he was not looking well I wanted to know what his mother had found out. Christopher told us that he had not been going to school lately, partly because he had not been feeling well but also because his power wheelchair was having some problems. We told him that we wanted to hike over to Erica’s to see her but would be at the car later. Several of the kids that were listening in on the conversation offered to meat us later at my car and then take us to where Christopher’s power wheelchair was. The dogs along the way to Erica’s house seemed a bit friendlier and we made it the entire way with out having to throw any rocks. I admit I did felt a bit silly when Erica’s father came to the gate and tried to shake my hand. I thought about offering him the rocks as a gift but politely laid them down beside the gate. A few more visits and he can gravel the path that leads to their house. Erica’s face and arms seem to be doing quite well with the medicine. Her legs and feet are improving but still have a long way to go. Her mother told us that she applies the medicine to Erica’s entire body every other day. Unfortunately each treatment takes two and a half $6 tubes of medicine so we are still looking for a cheaper place to buy it from. The improvements are well worth it though. Looking at her I remembered that frightened looking little girl that Chris and I had met over 2 years ago. She is still quite shy when we bring in strangers but has come so far. Did I dare invite her to camp where there will be so many new faces? I decided that it would not hurt to ask. To our surprise she said that she would love to go and an even bigger surprise was that mom and dad who are extremely busy with running a family business and raising 10 kids also sounded enthused. I think that the biggest problem with going to camp will be to decide which parent gets to come along with her. Due to the number of people that we can house we are trying harder than ever to keep the ratio down to one invited camper and one helper. Even though the sky was beginning to look like it could produce a thunder storm Erica’s family would not let us leave until they gave us some food. I had feared that it was perhaps the family meal but have learned from experience that there was no polite way to say no. After we had eaten our fill Erica’s family agreed that perhaps it might rain so we all said good by. When we finally returned to my car we found most of Christopher’s brothers, sisters, and cousins waiting for us. His mother was also there. Christopher’s mother looked extremely worried and could hardly talk about his condition with out breaking into tears. She told us that the Christian doctor that she had taken Christopher to had arranged a free cat scan for Christopher and the results were not good. Christopher has some type of a mass forming on his brain. She had been scheduled to take Christopher in for more tests last Monday but a lack of funds and Christopher not feeling well enough for the hour buss ride had prevented them from going. She is now going to try to take him in this coming Monday. She promised to keep us informed on what is happening because we want to make sure if he needs surgery it is done by the right doctor and even then only after being 100% sure that it is needed. Please pray for Christopher and his family. Pray for us to. When there are so many needs we need wisdom in knowing who and how to help. 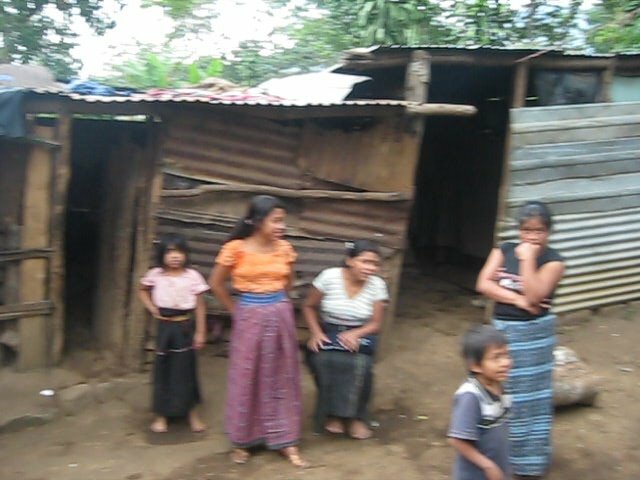 We managed to visit 2 more families before dark and then headed back to Xela. Xela is over an hour from where we visited our last family but not to many of the small towns and villages that we were in today have places for overnight visitors to stay. I know if any of the families knewn that we needed lodging they would have offered, but I talk in my sleep and was afraid that I would keep the other 5 or 6 people that I would be sharing a bed with awake. Tonight I have a room and a bed to myself granted it isn’t the worlds biggest bed but unlike last night this one is not made out of cement. I think that I will go and test it out. Tonight we are back at home in Chemaltenango. We stopped off and visited 2 different families on our way home. Both of the girls that we visited are excited about attending camp again this year. I have not tallied up the count but I think that once again we must have visited around 20 families this week. Not only have we invited a lot of people to camp but we also have lists of people that who are in need of some type of help. During the next few days we will be looking over these lists, trying to decide who to help first and who can hang on for a while. The 2 people that come to mind with out refreshing my memory are Christopher, who need brain surgery and the 15 year old girl who needs some one to take care of her for at least a little while. I decided to stop at Camperos before going home. They have wireless internet and that is the only way that I can get caught up on my e-mail because I knew that once I got home I would be bombarded with kids. Guess what though. I don’t know if Calin has spies out or what but for the second time in a row he found me before I even got into the restaurant. The computer would have to Waite. Calin had not talked to me in 4 days and he had lots to share. It was great to see the neighborhood kids when I got home. I didn’t even attempt to get any work done tonight. Rudy offered to make supper for the crew so I gave him some money for groceries. Soon he and Abner returned from the store with all of the fixings for a dozen hamburgers. I offered to help cook but he told me that he could handle it. he did a great job and soon all 12 of us were fed. After the kids cleaned up most of them watched a video on one of the computers. Some of the others found other things to do but due to the rain no one played outside. They all seem to be so much at home here. I could not help but wonder how they felt about my house being locked up for the past 4 days. Today has been a rather laid back day. The kids started to show up at around 7 AM. They seemed nearly as content to do little or nothing as I did. Most of them gathered around the computer and watched videos until I finally fed them at around 10:30. Calin did the dishes while Kimberly swept and mopped the house. I did some paper work and the rest of the kids watched more videos. The only interruption to an otherwise quiet morning was when Abner kicked Fernando for singing. Actually I guess that there were 2 interruptions. The second one came about 3 seconds after the kicking incident. That was when I escorted Abner out of the door for the rest of the day. I must admit though Abner is growing up in some ways. He no longer screams and cries when I punish him. A guess after being ushered out of my house so many times he is finally getting use to it. Abner is a good kid but I worry about him a lot. He is still going through life with a chip on his sholder not realizing that he is causing most of his own problems. Granted he has had a hard life but so have most of the kids that hang out here. Fortunately most of them have made the choice to make the best of it and go on with life. Please pray for Abner. he has so much potential but I worry about what kind of choices he is going to make as he approaches the teen years. I managed to get out of the house for a bit but only long enough to go and get a few things from the store. Right now I am franticly trying to finish up on my journal because I told the kids that I would let them all back in to the house at 5:30. I still have to decide about Abner though. I lost my rule book and can’t remember if kicking some one is a one day out of the house offence. I believe though that if it is a relative and you are not wearing shoes it is only a half day. There were an even dozen kids for supper again and yes Abner was one of them. I can’t believe it though. This has to be an all time record, not one glass of pop was spilled and my floor still looks as clean as it did when Kimberly mopped it this morning. That is a real wonder considering it is raining hard and the alley is nothing but mud. Everyone has headed for home except Calin and Fernando. I promised them that thy could spend the night. I am going to try to proof read this journal and get it sent out before going to bed. I know you are probably saying to your self, PROOF READ! Than why doesn’t he catch those spelling mistakes. Actually I manage to correct about 95% of them. Wouldn’t you love to try and read this before I corrected it.